Next week, the experiments at the Large Hadron Collider (LHC) will be back in action, taking data for the accelerator's second run. The detectors were shut down two years ago for maintenance and refurbishment in preparation for collisions at the higher energy of 13 teraelectronvolts (TeV). Long Shutdown 1 (LS1) saw hundreds of collaboration members working in and around the experiment caverns on improvements to the detectors. Four of these detectors – ALICE, ATLAS, CMS and LHCb – are enormous, sophisticated machines measuring up to 40 metres long and 20 metres long and made up of dozens of subdetectors, themselves composed of millions of sensitive sensors. Each subdetector is designed to determine the characteristics of one or more types of particle emerging from the particle collisions. These subdetectors include trackers, which reveal the paths of charged particles, and calorimeters, which measure the energy of some particles. All the data collected is grouped and analysed with a view to understanding what happened at the moment of collision. During the second run, up to one billion proton collisions could occur every second in the detectors. Most of the collisions do not yield interesting results and given the enormous quantities of data generated, it can’t all be logged. The trigger system therefore sorts the collisions, keeping just the most interesting events – several hundred per second. The data-acquisition system then records the data and sends it to the Worldwide LHC Computing Grid to be analysed by physicists. During the long shutdown, all these systems were verified and some were renovated or upgraded. Below is an overview of the main work projects that took place in the detector caverns ahead of the big restart. This experiment, which studies quark-gluon plasma – the matter present in the first moments of the universe's existence – made improvements to most of its 19 subdetectors. One of these was the electromagnetic calorimeter, which measures the energy of the electrons, positrons and photons produced by the collisions. Its range of detection was extended with the addition of the new di-jet calorimeter. Modules were also added to other subdetectors, and tens of kilometres of cables were replaced as part of a complete overhaul of the electrical infrastructure. In terms of computing, ALICE doubled its data-logging capacity with improvements to the trigger and data-acquisition systems carried out by the collaboration’s IT experts. The ATLAS detector can now see even better, thanks to a fourth layer of pixels in its pixel tracker, the subdetector closest to the collisions and whose function is to reconstruct the particle trajectories. Improvements were also made to the muon detectors and calorimeters, as well as to the entire basic infrastructure (including the electrical power supply and the cooling systems). Sections of the beam pipe, in which the protons circulate and collide, were replaced to reduce the background noise in the detector. With new, more efficient trigger and data-acquisition systems, ATLAS is ready to log more data than before: it will be capable of recording a thousand events every second – more than double its capacity during Run 1. In addition, an improvement plan to upgrade the simulation, reconstruction and data-analysis software used by physicists to conduct their research was carried out. The CMS collaboration carried out important work on its tracker so that it can function at lower temperatures: it was fitted with a new leak-tightness system and a refurbished cooling system. The central section of the beam tube, where the collisions take place, was replaced with a tube of a smaller diameter to allow a new pixel tracker to be installed during the next long shutdown. A brand-new subdetector, the pixel luminosity telescope, was installed on either side of the detector and will enhance the experiment’s ability to measure luminosity (a measure of the number of collisions produced in the experiment). 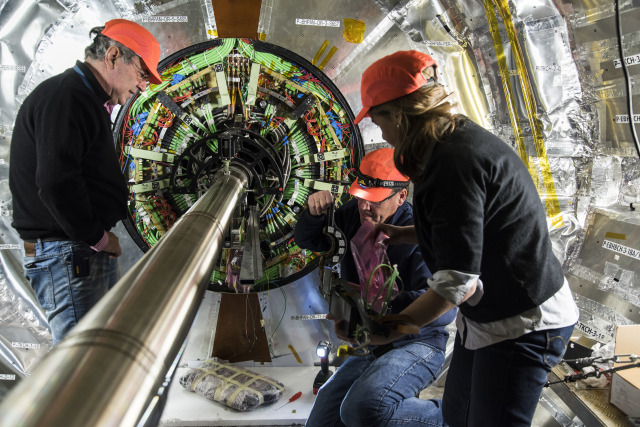 New muon chambers were installed and the hadron calorimeter, which measures the energy of particles containing quarks, was fitted with upgraded photodetectors. Last but not least, the trigger system was improved and the software and computing systems underwent a significant overhaul to reduce the time needed to produce analysis datasets. Read the CMS blog "The short story of the Long Shutdown 1"
LHCb, the experiment that investigates beauty particles, added a HeRSChel detector along the beam line in order to identify rare processes in which particles are observed inside the detector but not along the beam line itself. The experiment’s beam pipe was also replaced, as was the pipe’s supporting structure, which is now lighter and more “transparent”. The experiments are constantly striving to achieve transparency as the detectors must detect without influencing the results, for example by intercepting particles that they're not supposed to stop or by altering the trajectories. More information about the LS1 in the experiments.